Here are my top 60 fingerpicking songs of all time. The list has a very varied mix of artists and ranges from beginner to advanced. I created this list to help fellow fingerpickers choose songs for their repertoires and so they can always come back here for ideas for which piece to learn next. In the video, I give a quick demo of each of the 60 songs and each week on Thursday a new video lesson (with tab) is uploaded for one of the songs, gradually we're working through the list. Each and every one of these songs has something unique about them, and you will learn a huge amount just from giving some of them a go. If you want to give yourself a big goal you could try to learn them all and, if you do, I assure you that you'll become a great fingerstyle player! The best way to get good at fingerpicking is simply to learn a tonne of great songs. This list will turn you into a well-rounded and accomplished fingerstyle player because it covers so many essential techniques and so many nuances. I picked these particular songs because I wanted them to be well known and familiar to most people, especially people that are just getting into fingerstyle guitar and want some instantly recognisable tunes to have a crack at. 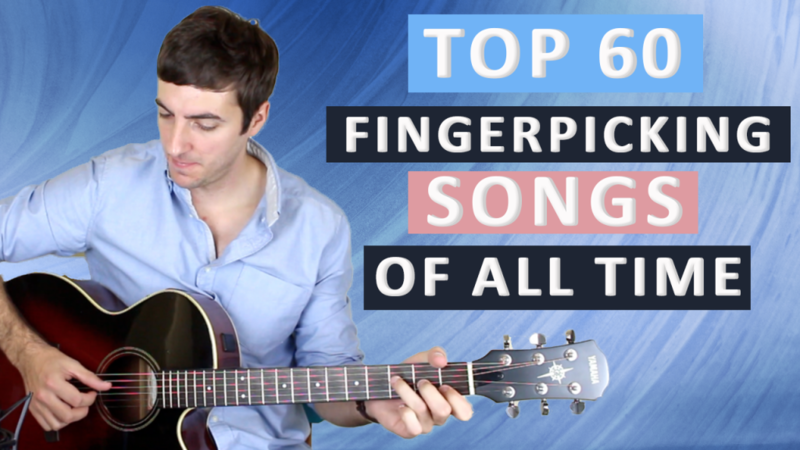 However, of course there are MANY other songs I could have picked across multiple genres and I'm sure that I have missed some real classics (please leave some of your favourite fingerpicking songs in the comment section below). Having said that I really do think this is a great list for people of all levels to refer back to for fresh songs to learn and as time goes I'll be making the list much bigger and more diverse. I really hope that you enjoy all the songs and I'm sure that it'll give you plenty to work on! For people who are brand new to fingerstyle then these are my top ten fingerpicking songs to get you going. You must be patient when you first get going because trust me, it's going to be a little frustrating. Your fingers will get mixed up and you're going to pick the wrong strings, but it's all part of the fun and just remember that every time you make a mistake (which will be often) you're one step closer to getting it right. 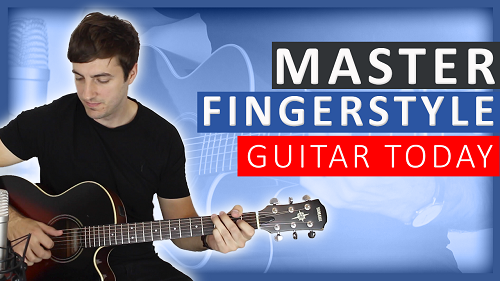 Learn all the essential techniques you truly need to master fingerstyle guitar. Dust in the wind and Freight Train are two very well known fingerpicking songs and are certainly the gateway into intermediate playing. If you could only learn two from these five I would recommend those two. However if you have the energy, go ahead and give the other three a go, you won't regret it. Things are really starting to heat up now and all these songs have their own challenges. These intermediate songs are where most of the really well known ones are and hopefully you recognise the majority of them. Again if I had to recommend just a few from the intermediate list I would say Road Tripping', Fire and Rain, Don't Think Twice It's Alright, Somewhere Over The Rainbow and Blackbird. 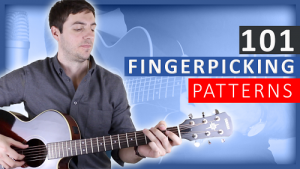 Learn 101 indispensable fingerpicking patterns (beginner to advanced). If you can play these songs then you're really on the path to success. These tunes are really quite challenging and will certainly require some dedicated practice. Personal favourites: Stop This Train, Going to California and Hey Hey. 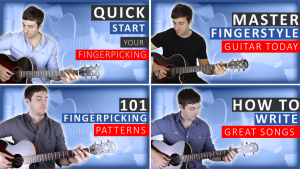 Get ALL Six String Fingerpicking's courses at a massive 35% OFF! Any song requests? Leave a comment below and I'll consider making a lesson on it sometime. Subscribe to my Youtube channel for weekly fingerpicking guitar lessons. Oh my God I absolutely love that show (and song). I’ve watched both series twice this year already! Sure I can put that on, they couldn’t have chosen a better song for that program. I would like to sign up for your courses too. I have now set the link for Nothing Else Matters so you can click through to today’s lesson – I hope you enjoy it! What password have you forgotten? If you would like any help in signing up to a course let me know, otherwise you can sign up here. I really love Jim Croce’s “I’ll Have To Say I Love You In A Song”. That would be great to have a lesson for. Yeah that is a really lovely song. Worthy of being on this list! Hi Craig, it depends whether you’re ok watching them on your phone or not. Ideally a laptop is better but you can still get buy on your phone. Great suggestion! Great band too. Keep up the good work! Your lessons are great! Thanks Anthony, Really pleased you like them. So great lessons…why not do a new round of 60? Why not a round of 1000? 60’s just not long enough. An Elvis song would be great btw…”Suspicous Minds” or “In the Ghetto”. Or more Beach Boys like for example “Surfer Girl”. Started your master course now and hope it will let me improve..
BTW ways to improve your site or rather develope it…Add function that would let me as a member upload vids of me learning stuff that you then could create a vid answering to with tip and stuff..
Making the site interactive in a bigger way.. I hope that the course really helps you improve too. That is a great idea, I will certainly at some point be adding a function like that. I really appreciate the feedback. Also as an idea you could give private lessons where you and student exchange videos perhaps 4 times per month once a week sort of on an approximate…learning songs and technique.. There are sites like true fire that does that and its great in the sense that as a student one can do it in my own pace…and i can live anywhere (where as Skype lessons require somewhat same timezones)..
Can you start doing some songs from your list of Beatles #1 hits?? Thank you, I love your work!!! Thank you for all the amazing lessons, so helpful! You have made fingerpicking a reality for me, can’t thank you enough. I just learned “Time of your life” from your lesson and I am really enjoying it. Would you be able to do a lesson on “59th Street Bridge Song (Feelin’ Groovy)” by Simon & Garfunkel? Such a happy sounding song. Really happy to hear you like the lessons! I’m sure at some point I can, thanks for the suggestion. A truly wonderful list of songs you’ve got here, and I think you capture the learning curve from beginner to advanced fingerstylist very well. If I may suggest you do a song that can develop from very simple to highly advanced over the course of many lesson. In my 30+ years as a guitar instructor, I have done this with fx. Fields of Gold, or Dust in the wind, but the concept offers many opportunities, and it’s a great way for a student to feel a tremendous sense of progress. Hey I love your videos. Would you consider taking a look at ‘In the Heartland’ by Mark Knopfler? I would love to learn this track. Cheers! Thanks a lot, I’m sure I can at some point in the future. Nicely done, Chris! I will enjoy exploring the songs on your list. As a song suggestion, would you consider “Larry’s World” which is on some Windham Hill collections (including Taylor guitar’s “Sounds of Wood & Steel” album)? Thanks! Thanks Greg, that’s a beautiful song. Thanks for the suggestion, at some point I’d be happy to do a lesson on it. Hi. I always loved ‘cant find my way home’ by Blind Faith, Eric Clapton on guitar. Hope you can do that one. Great song, I’d be happy to do it at some point. Love your lessons. Very well done! Great, I’d be very happy to do it at some point. Thanks for the comment Vicky, sounds like you’re working your way into intermediate territory – which is great! The list has take countless hours, but it’s been a pleasure and comments like yours make it all worth it. I’d be very happy to do your song suggestions in time. Got a couple of song requests and would love to learn these two! Could you do lessons on ‘Thorn Tree In the Garden’ by Derek and the Dominoes and ‘Going To The Country’ by Bruce Cockburn? Thanks Charlie, I’ll get round to them at some point! Amazing work with all these arrangements ! And thanks for the lessons, they’re great ! Hi Vincent, haha that would be a mammoth task! I love that song, Radiohead are one of my favourite bands. Maybe when I have a lot of time I can give it go. Hey. What about “When the children cry” by White lion? Great Song with lots of variations. I just found you wedsite WOW. Thankyou so much. i just started signe from E.C. fantastic. I’m looking foward to doing the courses. Again that you for all your great work. Hi John, thanks for the comment. Signe is one of my favourites too and more James Taylor would never be a bad thing. Thanks, in hindsight I’ve missed lots of songs, but there’s nothing stopping me adding them in the future. Good job, yeah that would be good, I love that song. I just located this site, it’s truly amazing! Here’s a song I have never heard nor have seen anyone properly disclose – the original studio version of “Can’t Find My Way Home” from Blind Faith’s debut album. Many perform a hybrid version of it or the “Fireside” version of this song. To me, nothing tops the original studio version. Thank you (regardless if you document it or not)!